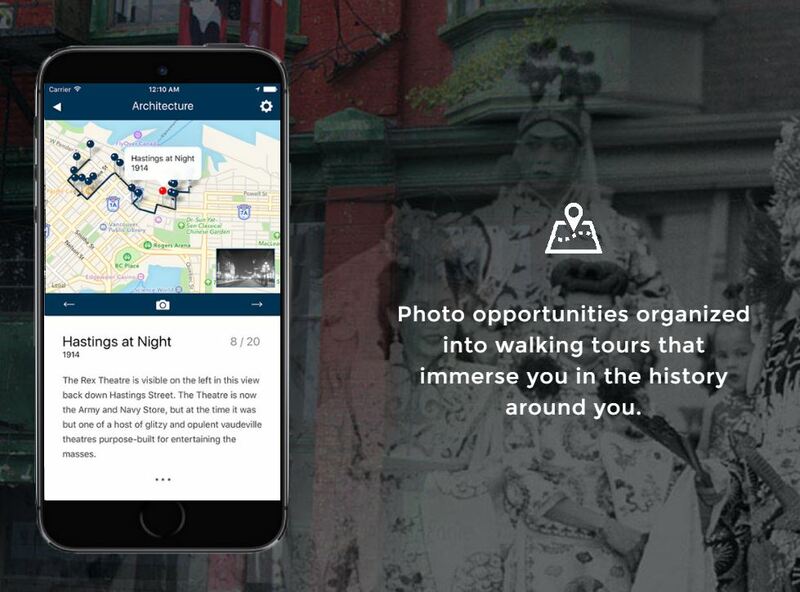 One of the most popular platforms for this type of public engagement is Historypin, which is a not-for-profit organization that provides “a place for people to come together, share photos and stories and tell the history of their local community.” By pinning historic photographs to a present-day street map, users are able to take virtual tours through the past. Contributors to the Historypin website tend to be archives, museums, and other heritage organizations, but the site is also popular for creating history projects in local communities. 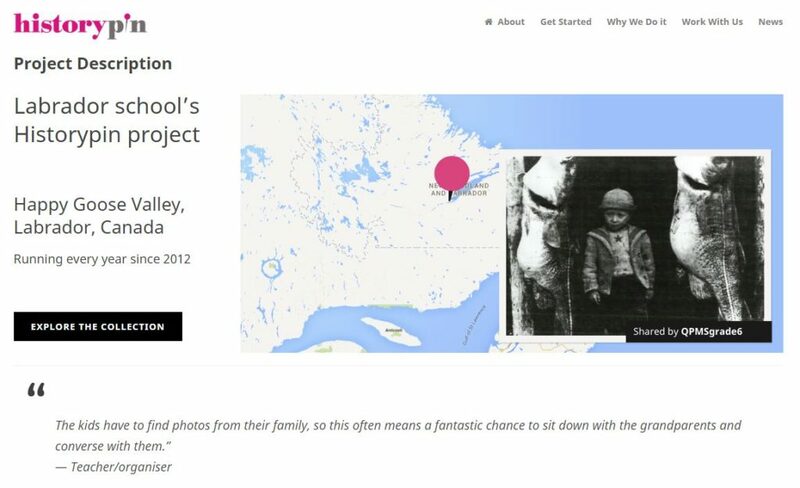 The Peacock Primary School in Labrador, Newfoundland developed a project that encouraged students to gather photographs from friends and family to find out the history behind them. The students then developed a digital archive of the photos using Historypin and created displays in their school. The project has helped bring awareness to the community’s history and helped to engage young students with their past. Locally, the City of Vancouver Archives has embraced this social media initiative and its Historypin Profile has nearly 800 photographs, which have garnered over 16,000 views. By layering archival photographs over present-day Google maps, you can easily imagine the streetscape as it once was. This is the key – the ability to bring the past to life in your imagination. It is difficult to examine an historical image and be able to see the angles and perspective that are necessary to situate your present self in the past. Seeing a static historical image layered over a present-day perspective allows you to transcend the boundaries of time. Mark Baggett, Rabia Gibbs, and Alesha Shumar from the University of Tennessee Libraries have written an informative analysis of their use of Historypin to promote access to their archival collections. I would highly recommend checking out their article in Kate Theimer’s “Outreach,” which is part of the Innovative Practices for Archives and Special Collections series. The article walks you through the the University of Tennessee Libraries’ Historypin project from the planning phase to implementation, and then offers some valuable conclusions and lessons learned. The authors chose Historypin as a preferred platform for several reasons, including “ease of implementation and the ability to add value to digital content using the platform’s geolocation-based ‘pinning’ tool.” They found that using a Historypin page required significantly less staff time than hosting a digital collection on their own website. They found that the images on Historypin were accessed an average of 22.4 times. They admit that this may seem modest, but when compared with the same group of images on their own website, the difference is striking. Those same images on their own website were only accessed an average of 12.4 times. The University of Tennessee Libraries concluded that this was an effective use of staff time that resulted in almost twice the exposure to the collection and to an audience that might not normally seek out the content on the University’s own website. Some of the most engaging uses of then and now comparisons come not from heritage professionals, but from committed and passionate enthusiasts who make use of archival images to make art, tell stories, or find meaning in the present. Art Director, Julien Knez uses archival images of Paris from Parigramme overlaid on present-day photographs in order to highlight the changes to the city over the past one-hundred years. Check out some of his beautiful creations here. His book provides a fulsome collection of small windows into the past that are both informative and visually stunning. The Archivists blog uses archival photographs in incredibly creative ways to bring meaning to the present. In their own words, they “unravel the DNA of places, through stories, lore, and visual history.” Their historic time lapses are incredible! Check out this one featuring the Hotel Vancouver that uses images from the City of Vancouver Archives. 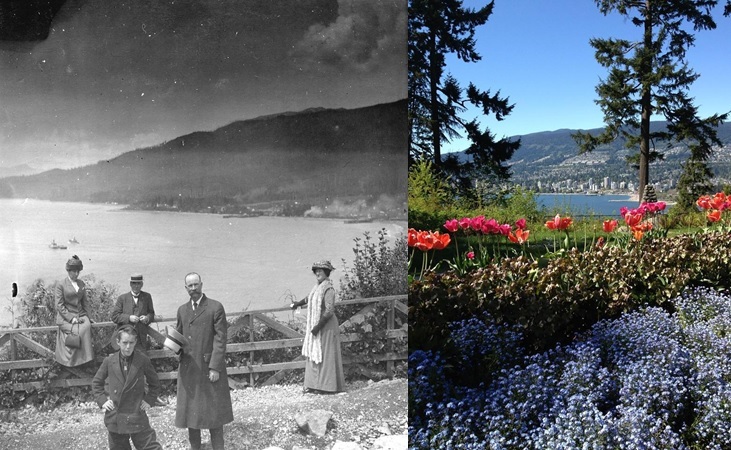 Or see how mapmakers of the past have captured Stanley Park‘s evolution over 150 years. I have found that similar apps are prone to crashing and are not terribly user friendly. This is not the case with On This Spot. I was immediately drawn in and found my way around its functionality quickly and with ease. Users can explore Vancouver through archival photographs precisely pinned to a street map. You can choose to explore using the map function, or you can choose one of Andrew’s carefully curated walking tours that enable you to explore your surroundings, with the help of your smartphone. To enhance the user experience, the app features a tool that allows you to fade between a historical photograph and one from today. Andrew has meticulously determined and photographed the exact locations featured in the collection of historic photographs, so that the fading is seamless. From the present, you are instantly transported back in time. I read once that Archives are the closest thing we have to a time machine and it’s a concept I use frequently when speaking to the public about archives. With the On This Spot app, we are taken one step closer. You can even use the camera on your smart phone to layer historic photographs over your current location, fading in and out. Perhaps you would like to capture this sense of then and now and be able to display it? The developers thought of this and have made it possible to blend the historic and present images to create mashups that you can save and share. 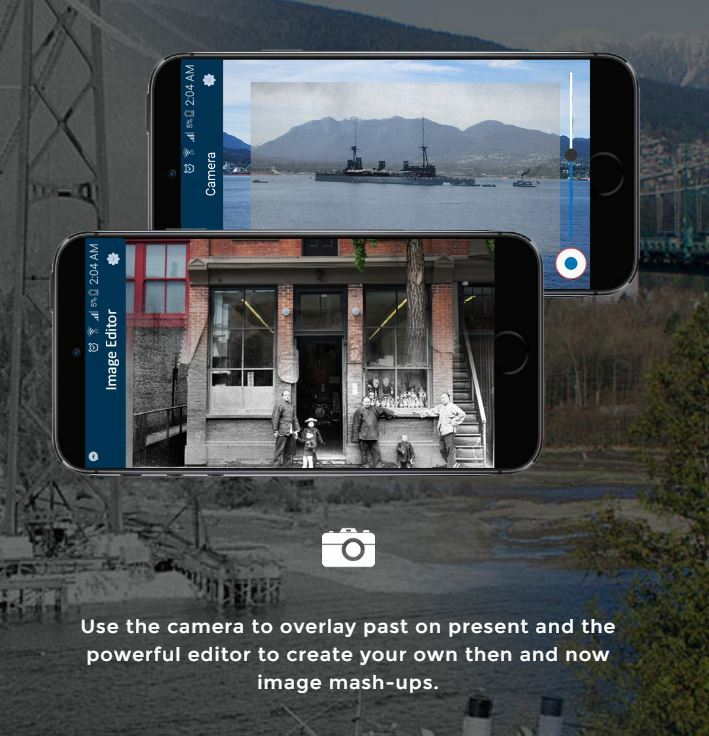 The app launched with over 600 historic photographs of Vancouver and the plan is to expand it to other cities in British Columbia and add new features over time. I am excited to see what the future holds for this fantastic project. Over the next few weeks, you may find me wandering around Vancouver with my head in my phone. People will assume I am playing Pokémon Go, but I will instead be learning about the incredible Stanley Park seawall, or the Great Fire of Vancouver in 1886. Then and now image mashups help us to visualize and understand historical events, changing landscapes, and human evolution. Where once there may have been a pile of rubble, a building reduced to dust through conflict, there may now be a reflection of current times. The comparison allows for commemoration of the past, while setting it in our present context. It can bring new meaning to places that you may have passed a thousand times. It can help to create a linear connection to the people and events that came before. I am so pleased to see that others share the desire to create a time machine, in whatever form it can take – be it an art piece, a website that connects children to their ancestors, or an app that you can carry in your pocket.